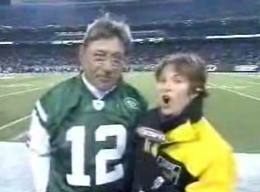 ESPN reporter Suzy Kolber has spoken publicly for the first time about former New York Jets quarterback Joe Namath's attempt to kiss her on live television. The sideline incident occurred during a December 2003 game between the Jets and New England Patriots at Giants Stadium. Namath was among several former Jets being honored at the Saturday night game aired by ESPN. In what has since become an infamous moment, an inebriated Namath said to Kolber, “I want to kiss you,” adding that he “couldn’t care less” about what was happening with the Jets team. Namath has said the entire episode made him realize he needed to address his drinking problem. “I feel awful about what I exposed her to that night,” said Namath.